Every one owns old clothes, especially those that they love to retain over years. If they don’t like them and have the money to buy new ones, they give those clothes to beggars or the needy. But many people can transform their old clothes and continue to reuse them for a long time. Sometimes, instead of purchasing new clothes, many find it cheaper to transform them with some tweaks, making them look beautiful. Transform the old drab and dreary clothes that mirror the best in fashion! Also, one does not really have to spend a fortune to convert these ugly and old clothes into perfectly new ones. Most patch development vendors also offer gorgeous patches to apply on clothes, that can transform the attire to a drastic degree. Use old articles of clothing for making patches that can actually cover up holes or torn fabric on pants and shirts. Also with some more creativity, you can add a new charm to your old clothes. Dye it: Do you want to get rid of that red sweater? Dye it yellow or green! Just like that, it will look as new! If jeans get faded, dye them blue, purple or magenta to appear trendy. Also, if you can get your clothes dyed and match them accordingly, thus boosting your wardrobe potential while increasing fashion points. Dying clothes is an old hat technique but still an impressive idea. 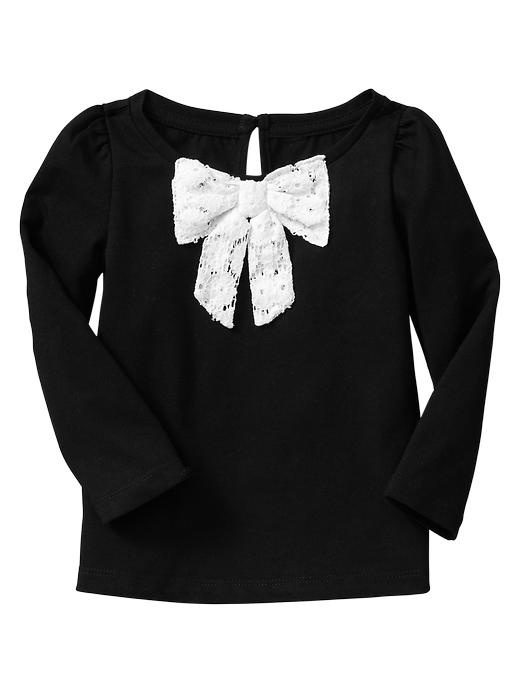 Add Bows: Bows work well on some t-shirts especially the v-neck or scoop-necked ones. You can make a huge bow and sew it right in the middle of the attire! It would look great if it has different fabric and color too. Some people prefer to add bows of the same color with some variations in patterns to fashion an elegant look. Add Flowers: One can spruce up old clothing with fabric flowers or buy some flower patches from the local craft store. Sew them around the collar or the handcuffs or sew some on the back of a shirt or hem them on a pair of jeans. 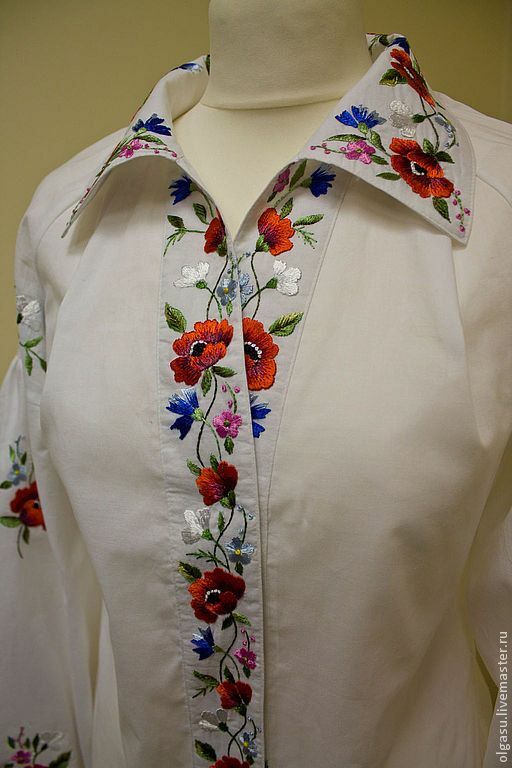 Some girls love to have embroidered flower patches that are in complete contrast to the color of their attire. Also, flowers can serve as an extension on the headgear when hats become old and dusty. They add sheen to the droopy hats. Convert Shirt To Skirt: Use the long sleeve winter tops as cute skirts with a bow during summers. It does look great on anyone! Skirts can also look trendy with a pair of jeans and shorts and can help nail the casual look. 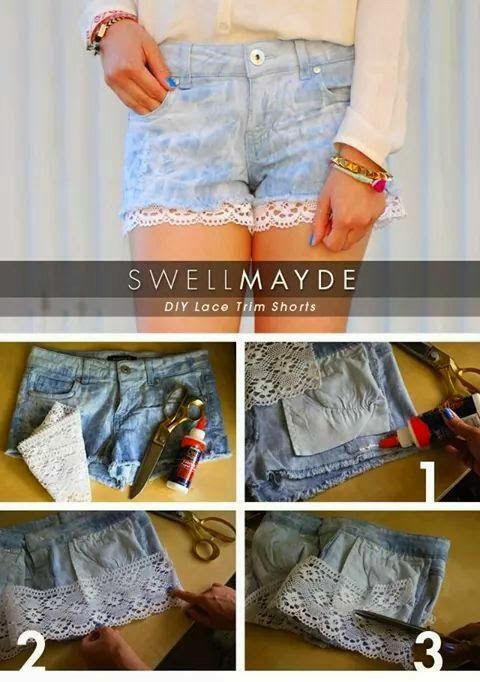 Add Lace Extend: This sewing project adds a unique touch to jean shorts with laces. With the laces, one can make those jean shorts larger in the thigh area. Laces are also good to use with clothes as drapes and at the end of the tops, sewn in equal distances across the hemline of the attire. Stitch on Artwork: If you love to embroider, you can stitch on a pattern, design, shape or something else on the clothes. Use color thread in a contrasting manner to help the stitches stand out of the attire like Blazers, Shirts, etc to stand out from the old clothes being used. There are varied stitching types that can be used on your attire that adds more texture and creativity to your old clothes. Men’s Dress Shirt Apron: The apron made from men’s shirt is a great idea, especially the long sleeved ones. Many wives and girlfriends manage to steal their partner’s clothes and put it to good use! Also, wearing your partner’s shirts as aprons can help reuse the old and dirty ones in the kitchen, saving money for aprons. DIY Elbow Patches: The heart elbow patch works the best on the elbow. One can use these patches on any fabric, and one would not require any lace! The elbow patches add an element of surprise to boring cardigans. The elbow patches can also be used to mend those clothes that are torn at the edges and need to be plugged with colorful patches. Sew on Patches: Clothing patches can spruce up jeans, hats, jackets, etc. They can be customized with designs and artwork, with any pattern, image, or quote. Sewing patches will help to mend the old clothes creatively even if there are holes and tears at the end or in the middle. Also, one can make something funny and creative to add a layer of fun to existing attire. Incorporate Laces: Laces can enhance the bottom of a pair of shorts or can be used to extend a dress longer. A piece of lace on the shoulders or the sleeves gives the attire an edge. A band of lace in front of a shirt can add texture. You can sew lace over a shirt’s section to create a sheer accent too. Scarf Turned Racerback: Without sewing, a few clever folds and knots can convert large scarves into racerback vests that will complement over a tank any day. Large scarves work as great vests owing to their length and the bright ones can add some newness to old clothes too. Draped Vests: Draped vests can be worn instead of a tank in the summer, providing enough coverage and show off. A printed t-shirt can be used to create draped vest fun and unique. Draped vests also hide the years of existing clothes gone old, losing brightness and color and can elevate any attire with sheer class. Add Sequins: Sequins add sparkle, shine, and glamor. String a few strands of sequins around the neckline, line the hem of the bottom or use them to embellish a pair of shorts. The sequins can be added to clothes to make even the ordinary top or dress to stand out from the crowd, despite losing its freshness. Crop Top: The cropped top can be worn over sports bras, swimsuit, or on a fitted tank top. They do not need sewing but can be customized with cut-outs in revealing sizes. Crop tops can also look trendy if cut with some new designs and some new angles. Lace Jeans: The rips or tear on your jeans can be patched up perfectly with laces. Or one can create a fresh horizontal rip on the torn part, use a sewing pattern that would match with the lace. Different colored laces can liven up a drab pair of jeans to immediate effect. Transform the size: If jeans are too short, cut them off at the legs and use them as shorts! Long t-shirts can be snipped if sleeves are too big! Transform one article of clothing with some smart choices. Ensure that even with the size transformation, there are no ugly strands left around or else the transformation would not work! Convert Boot Cut Into Skinny Jeans: To convert boot cut jeans into a pair of skinny ones, a sewing machine, and some skill is required. Add a zipper for more zing! Also, a pocket can be patched through with some funny cartoon at the back, to give zing to the old. T-Shirt Maxi Dress: If you get holes at the bottom of t-shirts and tops, then one can stretch them into longer maxi dresses. One can solve the hole problem and a skirt can be made from men’s long shirts. These maxis can be very comfortable to wear at home. 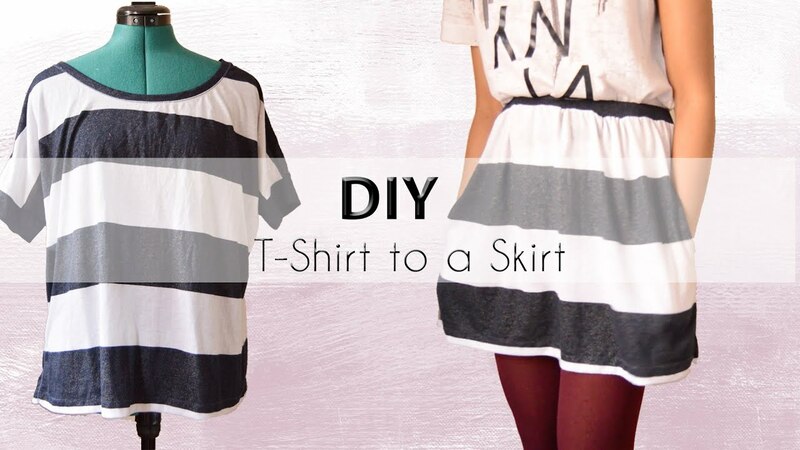 Refashion the T-Shirt: You could convert any of your t-shirts into a top for summer with some cuts. Get an attitude to wear with the new top too. One can even add a bit of gloss, some beads, some embroidery on pockets or just a contrasting hemline at the end of the t-shirt. Tee Shirt Halter: The t-shirt turned halter needs a few snips and tricks with scissors and good tying ideas. The halter can be worn as you want it, they can be tied in different ways. Check out the ideas to wear a halter so that the same attire can be worn in diverse ways without any hassle. Each of the ideas mentioned above to transform old clothes is not quite tough. But using creative patches is something else in terms of impact, style and messaging. Patch Emblem is one company that can deliver embroidered patches, woven labels, emblems, chenilles etc. The company creates several patches that can relate to a business, club, team, school or an NGO. An insignia patch on a garment works big time for uniforms, jackets, and shirts. At Patch Emblem, the team not only creates and delivers outstanding patches to customers but also elevates design, helping the user to stand out.